Obesity has become one of the biggest problems facing zoo elephants today -- and threatening their ability to reproduce. About 40 percent -- nearly half -- of African elephants in captivity are affected by obesity. "Much as we see in humans, excess fat in elephants contributes to the development of heart disease, arthritis, a shorter lifespan and infertility," Daniella Chusyd, M.A., a doctoral student in the University of Alabama at Birmingham Department of Nutrition Science who recently launched a study to examine the problem, told Phys.org. Even worse, a high body mass index in elephants is strongly correlated with abnormal ovarian cycles, which means that the U.S. zoo population could face a challenge in the coming decades. In order to keep its population stable, zoo elephants in the U.S. must produce about six calves each year -- but the current average is only around three births a year. 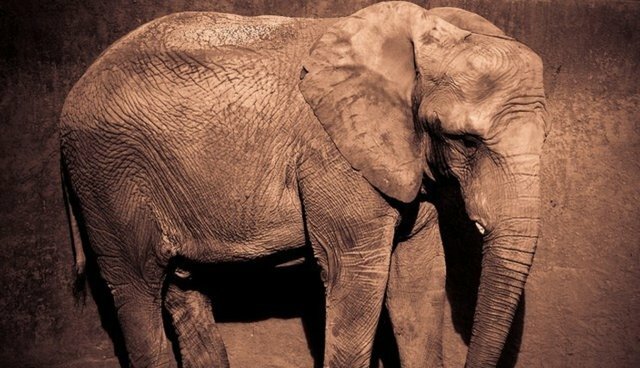 One scientist suggested that at the current rate, "the African elephant could be gone from U.S. zoos within 50 years." These aren't the only issues faced by captive zoo animals. Other psychological problems induced by some zoos can be just as harmful -- though often less obvious. See this post for a guide to stereotypic and obsessive behaviors observed in zoo animals.